Why did you start blogging about food? Did you do it because you loved to eat, cook, and write? Maybe as a way to make the very personal experience of food more social? Or do you love to tell compelling stories with beautiful pictures? Now that you have started down this path, whatever your reason for starting, that reason has now brought you to a higher calling. This October 24th, the Center for Science in the Public Interest will launch the first ever Food Day. They hope to build Food Day in to an analogue to the 40 year old Earth Day, helping people relate to the often complicated policy issues that affect their daily lives and those of countless others in our economy. Being dedicated to making real food fun every month, the Boston Food Swap decided to host a special event in honor of Food Day. 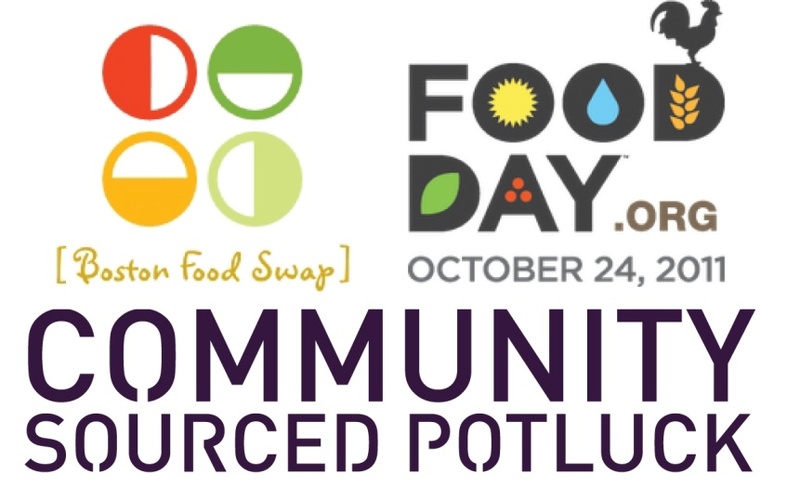 We are holding a Community Sourced Potluck (CSP) on October 24th. At this event, attendees will be encouraged to submit their own dish at the event and document that dish’s journey before the event online. The best dishes with the best Food Day stories will win prizes while the stories will be held up as an example that making sustainable choices about food can be a fun adventure. We cordially invite you, Boston Food Bloggers, to help write (photograph, illustrate, create the soundtrack to, etc.) Boston’s Eating Real story. We have set up a Tumblr site for multimedia submissions from non-bloggers, but we would also like to see your own Food Day story posted on your own blog and linked to the microsite. We would also like to invite you to attend the event to share your dish and your story. The invitation will be posted via our Facebook page, Twitter feed, and the Eventbrite host feed when it has been finalized. The CSPI and the Food Day Massachusetts organizing committee have plans to aggressively promote the launch of Food Day and expect the interest to be wide. Because participating in the CSP real-life /online project is a great cause, we expect the buzz level to be high leading up to the 24th and expect that a lot of people in Boston and beyond will want to hear your stories. 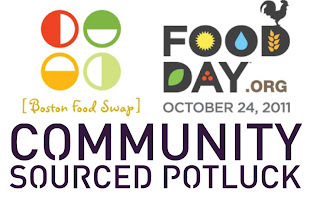 If you are scratching your head trying to understand how you will be able to write about your Food Day experience even if you’re not a food policy geek, every Monday leading up to Food Day, the Boston Food Swap will feature a guest blog post on one of these Food Day principles. Our goal is to explain to people why these principles are important to them in their lives and how they can take action on each principle to make their food system more sustainable. We also hope these posts will offer guidelines for people who would like to submit to the project by explaining, for example, how they can tell if their food was made or grown by farm workers working under fair conditions. These posts should help you craft your message. Thanks for your time and I can’t wait to start reading your stories of Eating Real! Agen Bola Terpercaya indo11.com melaporkan, Dua juara dunia tinju Inggris, Scott Quigg dan Jamie McDonnell dijadwalkan akan turut meramaikan duel ulang antara juara kelas penjelajah WBA Inter-Continental, Nathan Cleverly kontra Tony Bellew di Echo Arena, Liverpool, 23 November mendatang. Quigg, yang menggenggam sabuk juara kelas bantam super WBA, akan bertarung mempertahankan untuk kali kelima dalam laga tersebut. Namun, hingga saat ini pihak penyelenggara Matchroom Boxing masih belum menentukan siapa lawan yang akan dihadapi oleh Quigg. Sementara, juara dunia kelas bantam WBA, McDonnell akan dijajal penantang asal Kolombia, Walberto Ramos. Apabila mampu meringkus Ramos, McDonnell akan mendapatkan kesempatan duel unifikasi kontra juara WBO, Tomoki Kameda. Selain diramaikan oleh dua juara dunia tersebut, kontes utama Cleverly versus Bellew juga akan dibuka oleh penampilan Anthony Joshua, yang akan berhadapan dengan Michael Sprott dalam duel eliminasi gelar kelas berat Inggris. Lalu terdapat juga duel eliminasi gelar kelas menengah super WBC antara Callum Smith kontra Nikola Sjekloca.